Work with Metal + Glass! 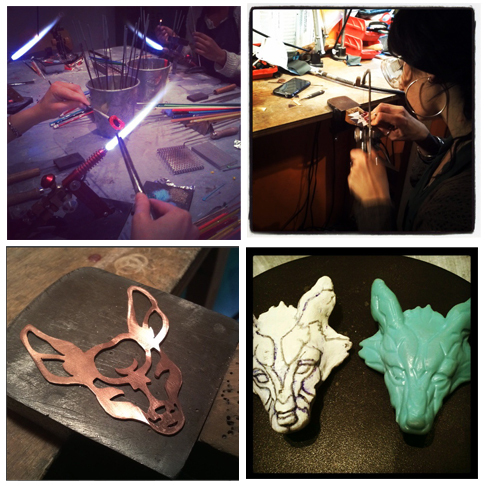 Learn the basics of hand fabricating objects and wearable sculptures/jewelry, lo-tech casting, flame-working, fusing, vitreous enamels on metal, bezel-setting cabochon stones, and more! $340.00 per person, 4 people max per course, 3 people min – $170 deposit required to hold space. Focus on beginning mandrel wound glass beads. Working with beautiful Italian, Chinese and German hand-pulled glass students create beads, and rings. History is discussed, glass formulas, annealing cycles, glass suppliers/makers, and more! Create your own glass beads. Continuing where you left off the 1st day, learn how to sculpt different forms, rake, encase, make ‘twisties’, simple murrini, mix your own colours! Make hollow, florals, zebra & tiger striped beads, start sculpting! metal -in- glass! Using silver foil/leaf in your beads. Work with ivory glass, silver and clear, pull silvered ivory stringer. Add silver foil to other colours and see what happens! Demonstrations in fold forming, etching (copper & silver), and hollow forms (making silhouette dies), electroplating, enamelling, sand casting. This course gives students hands on experience manipulating metal, electroforming, and embellishing metal, while sharpening soldering and fabrication skills working on personal projects. Students will work together and independantly on their projects. 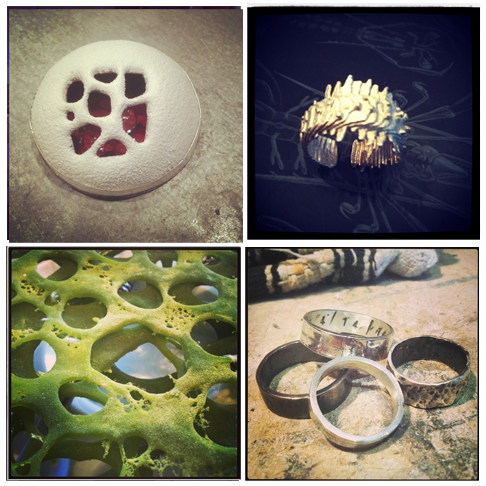 This course starts out with an introduction on techniques covered, expectations, design considerations, and ends with students finishing off fold formed samples/pieces, an etched hollow form, electroforming organic/inorganic objects, and sand casting. Fast paced, students need to show up ready for action! Beginners welcome! Fused glass (Kiln-glass) is frequently used in jewelry, but the emphasis is often on quantity rather than quality. In this class you will learn to distinguish your work through thoughtful design, careful studio practices, multiple firings, coldworking methods and, ultimately, good craftsmanship. Various glass c.o.e’s will be discussed, compatibility, annealing schedules, slumping and tack fusing. Instruction will cover creating jewelry elements for a variety of forms, functions and styles; working with pattern bars, Vitrigraph, stencils, etc. Samples of and discussions about using kilnformed elements in jewelry applications or with other wearables will also be included, as will practical considerations such as studio setup and costs. All materials included. No experience necessary! Learn the basics of glass casting. Up-cycle your wine or beer bottles into a beautiful work of art! Students will learn how to make molds of existing objects using Alginate, as well as model new ones from clay and wax. Working with beautiful crystal- Gaffer Glass, soda lime -Bullseye- glass as well as recycling wine and/or beer bottles students will learn different firing and annealing schedules for casting glass. And simple cold-working without expensive equipment! No experience necessary!